This essentially square Weybourne Summerhouse features an overhang corner entrance and is one of our wider range of timber garden summerhouses, all of which include free delivery and installation. Finished in contrasting Pebble and Cream Valtti paints, the grey slate effect roof tiles provide an elegant, durable and cost effective finish with has a life expectancy of around 50 years. A painted matchboard lining, complete with roof, floor and wall insulation was installed and provided an attractive and inviting interior. 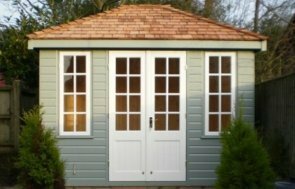 View our complete range of garden sheds, garden studios, garden rooms, timber garages or our range of hand-crafted Victoria greenhouses. All our garden buildings are handmade to order in our Norfolk-based factory by our team of experienced craftsmen. 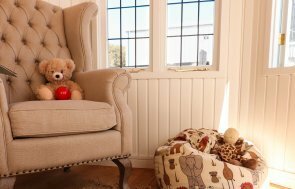 We also use the highest quality FSC® certified Redwood, sourced from a timber mill in Northern Sweden, which practises sustainable forestry. Alternatively, why not visit our Show centre in Newbury, Berkshire, where you can view more than 25 different buildings on display and get a feel for the quality for yourself. Or, you may like to request a callback or contact us to discuss your requirements in greater detail with one of our friendly team.